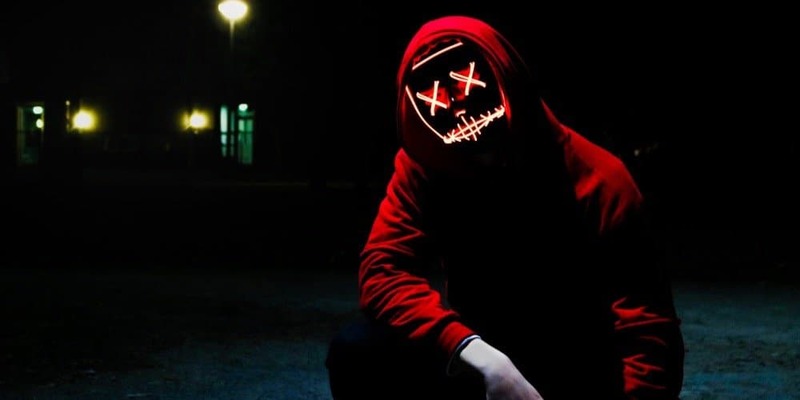 Myth Busted: Is Dropshipping Dead in 2019? 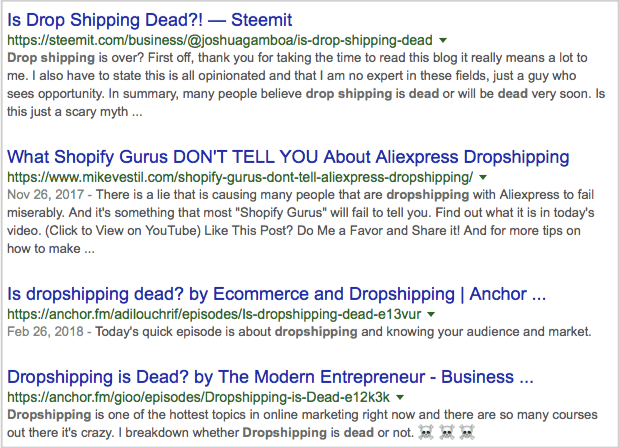 Is dropshipping dead? Does dropshipping work? Is dropshipping worth it? The answers to these questions are obvious – still, for some reason, they continue to bug thousands of people all over the globe. When you are standing at the doorstep of your first dropshipping journey ever, most likely, you don’t know much about this type of business and its prospects. This is why you go online in hopes to see dropshipping explanation for beginners, or a checklist of must-have things at the beginning, or the advantages of the dropshipping business model, or the opportunities for your future growth, or something like this, encouraging and helpful. Sitting in one of the spacious downtown offices generously rented by our CEOs, and surfing the Web on my shiny Mac beside 50+ colleagues who develop, test and improve this business-related solutions, I personally giggle at all the hysteric Internet posts that pronounce dropshipping dead and claim it has no future. And you know what? I strongly advise you to do the same and not to take any of these statements seriously. Dropshipping will outlive us all, and here is why. Surely, there’s nothing funny about actual people’s worries and concerns: it’s natural to be anxious about the things you don’t fully understand or know yet. People go online to learn more about the business they’re planning to launch, and obviously, they look for the advice of more experienced entrepreneurs. 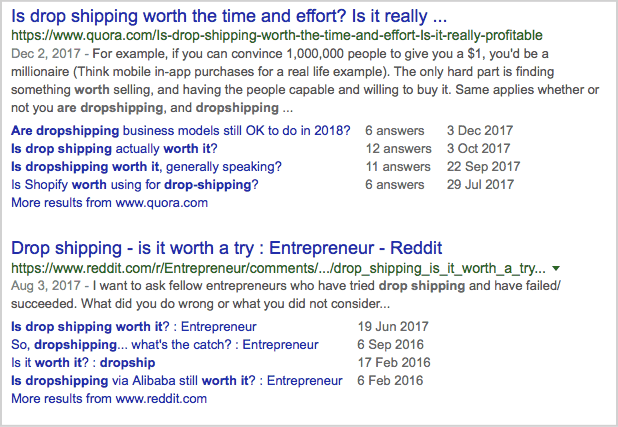 There is absolutely nothing wrong about these questions: they simply show that dropshippers-to-be are genuinely interested in the financial prospects of this business, and (unfortunately) lack information on the topic. The sad part, however, is that yellow press takes advantage of this public interest and speculates on it in the most misleading way possible. So, let’s go through the most common arguments these ‘experts’ use while talking about the future of dropshipping. Here’s a Google Trends graph showing the frequency of searching for the ‘dropshipping’ term in the last 5 years. Can anyone seriously insist that the ‘golden era’ of dropshipping has already ended? Is it even logical and sensible to say that ‘dropshipping was hot in 2010s, but it’s all over now’? 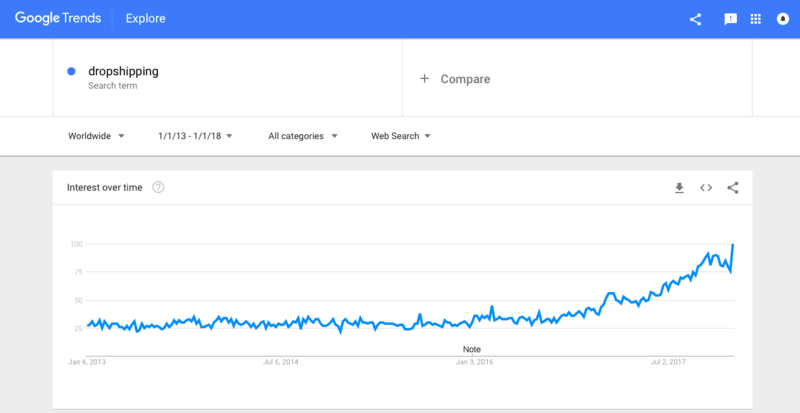 This graph clearly demonstrates that the number of business persons interested in dropshipping model is growing steadily no matter what – no political turmoils, wars, economic crises, etc. can stop people from pursuing their dream. Plus, a considerable surge in public interest towards dropshipping has started less than a couple of years ago – it lets us assume that this whole business scheme is currently on its early growth stage, and the best is yet to come. These assumptions are proven statistically: just take a look at this graph, and you’ll see that in 2017, the whole e-commerce industry accounted for only 10.1% of all retail sales worldwide. It’s only 10%! And for drop shipping business in particular, the number is even lower because clearly, not all of the e-commerce transactions can be classified as dropshipping-related actions (and we will talk about it further). To sum up, drop shipping business has an incredible room for growth: on global scale, its operations now account for a small yet promising percentage of all the acts of purchase and sale. This is quite a common business fear: if something gets insanely popular in a short time period, all the related spheres instantly get overly saturated with entrepreneurs making profit from it. In other words, the more demanded something becomes, the more intense the competition gets – so, if you’re not already in, you won’t have a chance to succeed. Sounds slightly reasonable, but let’s take a quick look at the industry statistics. 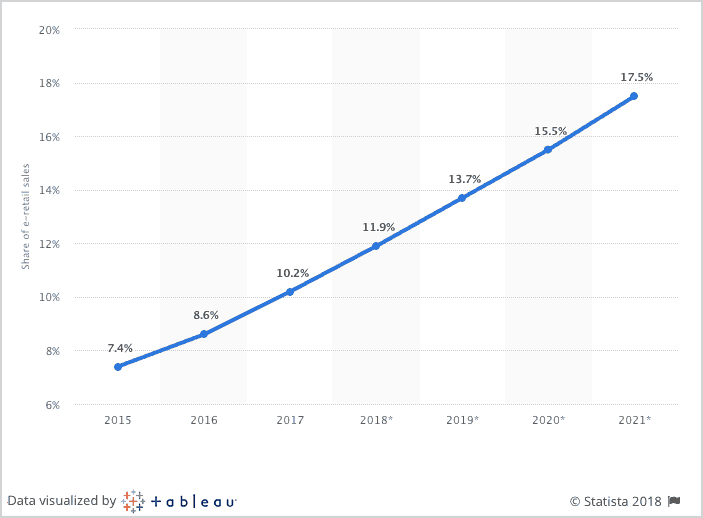 As Statista researchers report, only in the United States, there will be 230.5 million digital shoppers by 2021. Can you imagine the number of enterprises that is necessary to satisfy the needs of all these shoppers? And don’t forget: it’s only the data for the United States! Take a look at other geographic markets, and you’ll see that it’s early impossible to create an ‘excessive’ online store – with due marketing efforts, there will be enough buyers for everyone. Southeast Asia’s Internet economy for example, is predicted to reach the $50 billion mark in 2018, and for 2025, the number is estimated to be around $200 billion. So, it’s possible for a dropshipping store owner to successfully target any geographic market and reap the rewards of the business flexibility: its specific mechanism makes it easy for everyone to dropship from any country on the globe. 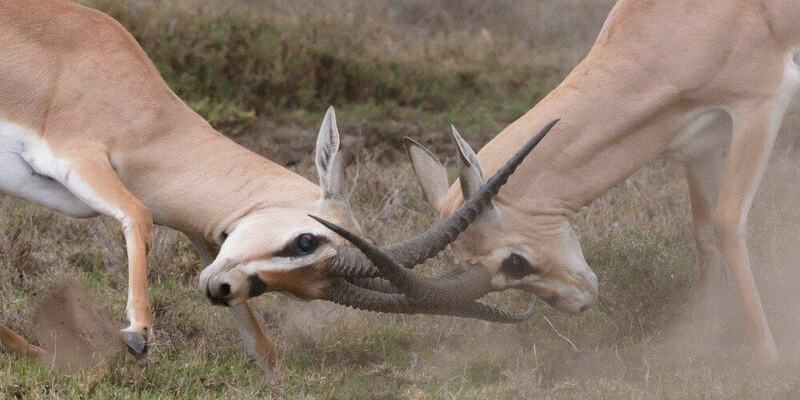 Dropshipping opponents dare to say that a business which is so quick to start and so easy to run can’t bring the owner any considerable returns. To clear these doubts and get a full picture of what’s happening, again, let’s consider the global e-commerce trend. Judging by the Statista data, the expected volume of retail e-commerce sales in 2018 is due to be around $2,774 billion. At the same time Lehigh, one of the leading research universities in the USA, figures it out that dropshipping sales and purchases constitute 25-30% of all the e-commerce transactions. 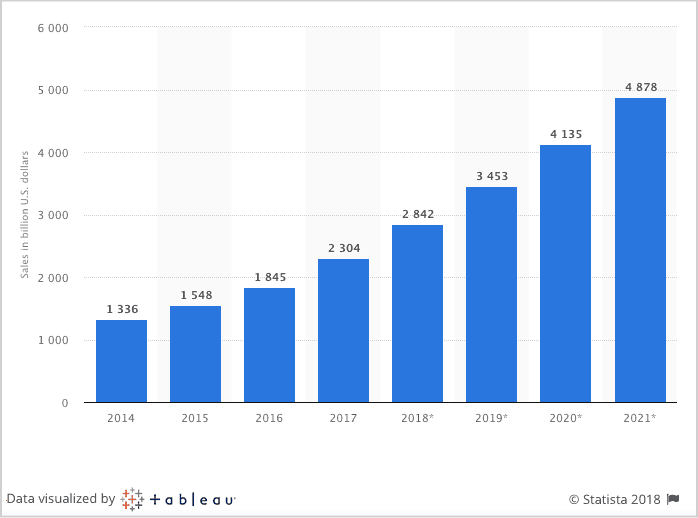 It lets us roughly estimate that by 2021, the volume of global dropshipping sales in 2021 will exceed $1,500 billion. Isn’t this number impressive enough? Doesn’t it showcase a thrilling opportunity to get a fair share of this jaw-dropping amount of money? Surely, you might say – ‘nah, it’s all about large-scale businesses, it has nothing to do with me, a mere mortal”. But how, in your opinion, have all these multibillion-dollar empires started? The incredibly inspiring example of Zappos shows that it only takes a first step to embark on this breathtaking journey. Zappos, in the same manner as Amazon, has started from humble beginnings – but look what both of them managed to achieve in the course of time. 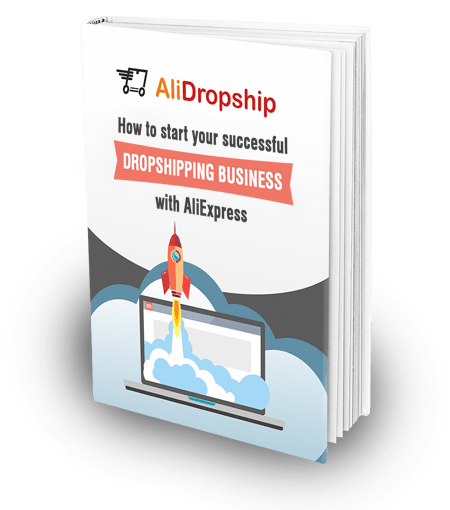 Each and every person proudly sharing their first dropshipping achievements, whether it be $600 revenue in the first two months or $3,000+ in sales daily, has the chance to build a mind-blowing e-commerce venture – and you can do the same, too. 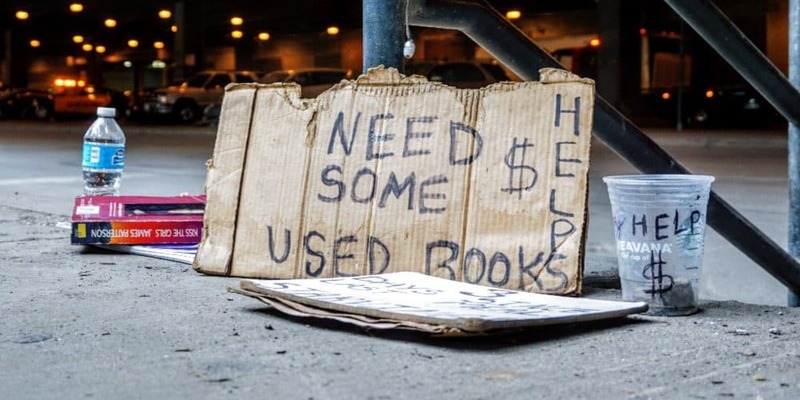 On a $1,500 billion market, there’s a place for everyone! The simple fact is … there is always more people buying stuff than there are people selling stuff. As long as that trend continues … dropshipping or any kind of retail business will work, to varying degrees. I must add to your facts that DROPSHIPPING have taken over the Blogosphere and AFFILIATE MARKETING. So does Thomas’s should keep on doubting as the greenbacks keeps raining. I’m dying to own my own DROPSHIPPING store but l live in a PayPal blacklisted country Ghana to be specific. I have a payoneer Master Card can it be used for the DROPSHIPPING store? With my limited resources how can l tap into this new golden opportunity. 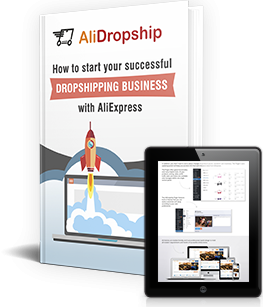 DROPSHIPPING is the new era of Digital marketing. So let’s all get involved. We’re currently in a niche, where we have pretty hard competition from Wish. I enjoy this a lot! You have answered all my hesitations. This made me reconsider my plan on embarking on this journey once and for all.